LONDON, UK, 2018-Oct-16 — /Travel PR News/ — The National Basketball Association (NBA) and Norwegian announced today (Oct 15, 2018) a partnership that sees the award-winning airline named presenting partner of the NBA London Game 2019. The regular-season game will feature the Washington Wizards and the New York Knicks at The O2 on Thursday, Jan. 17. 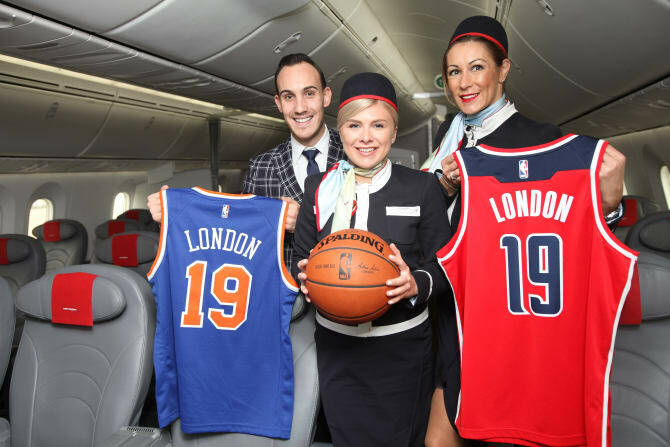 In addition to being the presenting partner of the NBA London Game 2019, Norwegian, voted world’s best low-cost, long-haul airline,will receive prominent brand exposure, including event logo inclusion, oncourt and in-arena signage, along with creating bespoke content with NBA legends and hosting fan activations and promotions leading up to and during the game. The Wizards’ roster currently features All-Star guards Bradley Beal and John Wall, who last season led the Wizards in points and assists, respectively, as well as eight-time NBA All-Star center Dwight Howard. The Knicks’ roster currently features Latvian forward and 2018 NBA All-Star Kristaps Porzingis, French point guard Frank Ntilikina and guard Tim Hardaway Jr.
As part of the partnership, Norwegian will offer fans the chance to win tickets to the NBA London Game 2019 presented by Norwegian. In addition, they will give fans the opportunity to travel with their award-winning airline to experience a 2018-19 regular-season NBA game in the United States. Norwegian offers flights to several U.S. destinations, including Boston, Chicago, Denver, Los Angeles, Miami, New York, Orlando and San Francisco. Fans in the UK can find more NBA information at NBA.com/UK, and on Facebook (NBA UK) and Twitter (@NBAUK). Fans can also purchase all the latest Knicks and Wizards merchandise at NBAStore.eu and at The O2 on game night. The NBA is a global sports and media business built around four professional sports leagues: the National Basketball Association, the Women’s National Basketball Association, the NBA G League and the NBA 2K League. The NBA has established a major international presence with games and programming in 215 countries and territories in 50 languages, and merchandise for sale in more than 100,000 stores in 100 countries on six continents. NBA rosters at the start of the 2017-18 season featured 108 international players from a record 42 countries and territories. NBA Digital’s assets include NBA TV, NBA.com, the NBA App and NBA League Pass. The NBA has created one of the largest social media communities in the world, with 1.5 billion likes and followers globally across all league, team, and player platforms. Through NBA Cares, the league addresses important social issues by working with internationally recognized youth-serving organizations that support education, youth and family development, and health-related causes. Norwegian carries 5.8 million UK passengers each year from London Gatwick, Edinburgh and Manchester Airports to 50 destinations worldwide. Norwegian is the third largest airline at London Gatwick, with 4.6 million yearly passengers, and with more than 1,000 UK-based pilots and cabin crew. In 2014, Norwegian introduced the UK’s first low-cost, long haul flights to the U.S. – the airline now flies to 12 U.S. destinations, Buenos Aires and Singapore. In 2017, Norwegian also launched affordable transatlantic flights from Edinburgh, Belfast, Dublin, Cork and Shannon to the U.S. East Coast, using the brand-new Boeing 737 MAX aircraft. Norwegian is the only airline to offer free inflight WiFi on UK flights to more than 30 European destinations. The airline has one of the youngest aircraft fleets in the world with an average age of 3.7 years, including next-generation Boeing 787 Dreamliner, Boeing 737 MAX and Boeing 737-800s. Norwegian has been voted ‘Europe’s ‘best low-cost carrier’ by passengers for six consecutive years at SkyTrax World Airline Awards from 2013-2018, along with being awarded the ‘World’s best low-cost, long-haul airline’ in 2015, 2016, 2017 and 2018. Norwegian Reward is the airline’s free to join award-winning loyalty programme offering members CashPoints and Rewards that reduce the cost of Norwegian flights. This entry was posted in Airlines, Entertainment, Festivals and Events, Sports, Travel, Travel Services, Travelers and tagged Frank Ntilikina, London Game 2019, NBA, norwegian, Tim Hardaway Jr., Vandana Balachandar. Bookmark the permalink.